The ARTisan preamplifier is designed using the resistor made by us. The resistor is made of pure copper wire, world first Cryogenically Purified Crystal Copper Wire which is also used in our R-1000 series X type. The resistor is made by winding the wire into a coil that has no inductance through a special process. Then our resistor can transfer the output signals with no noise and no inductance at all. You can listen to the effect in the pure sound of the Artisan. ARTisan employs a simple but most appropriate CR type RIAA equalizer circuit. Figure 1 shows RIAA recording circuit. As shown therein it has to be noticed that this circuit is comprised of CR configuration, as there is no necessity to employ other type of equalizer such as LCR or NF type. For precise reproduction of time information in musical elements, restoration is required to be made under the condition equal to original sound through CR type circuit. Because, music reproduction to natural sound equal to the reality is made best only by correctly reproducing time factor. ARTisan works with 9 pcs. of NiCd batteries in order to avoid normal power circuit noises. So the minute signals from an MC cartridge can be clearly amplified in the circuit. In addition, the Artisan is equipped with 2 types of stabilized rectifier circuits. One drives the linear amplification stage, and another equalizer stage. Thanks to these, extremely stable operation and noise-free amplification with wide dynamic range are secured. ARTisan accepts both MC and MM phono cartridges at respective input connectors. Figure 2 shows the Input Switch which enables you to use 2 turntables for comparison. For a listener who wishes to use an MC cartridge in the future, MM operation assures you of fine and unwearied performance of Artisan. MM input mode allows connection with an MC cartridge through ZYX CPP-1 pre-preamplifier, or an MC step-up transformer, or a head amplifier, so you can use 2 MC cartridges simultaneously. Please refer it to Figure 3 wiring diagram. 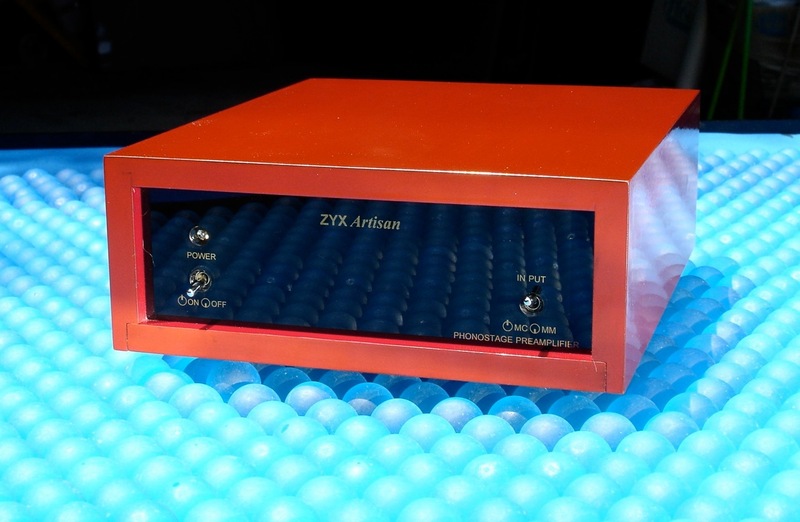 A metallic shielded box makes the sound signals disturbed by some eddy currents occurred on the shielding surfaces. The ARTisan has no metallic surface around the circuitry. It enables you to listen to the effect in the fastest response in the sound of MC cartridge. Three different colors are available: Japanese Red semi-matt finished with genuine Japanese traditional ‘urushi’ lacquer coating (yes, you guessed it right, Mehran’s favorite), matt Black “urushi” finish, and natural Clear wooden finish with urethane coating. Hook up RCA audio cables to a turntable system and preamplifier. Make sure that the tone-arm grounding wire is connected to the GND terminal of the Artisan. Connection of the grounding wire from the phono motor is subject to your listening result. Be sure to lower the output of the speaker with the level control before cable hook up. Note: Please do not open the wooden box of ARTisan, otherwise the input resistors will be damaged soon, since they are made of very thin wire. Also, do not touch the batteries to avoid electrical shock on you.